Other than Asian restaurants, specifically Chinese, there are not a huge amount of options in terms of brunch on Christmas Day. For as long as who knows when, we would go out for Dim Sum if we wanted eats on the 25th. This time around, we figured something different was in order. But where? Ah, hotels! They are open year round including their restaurants. 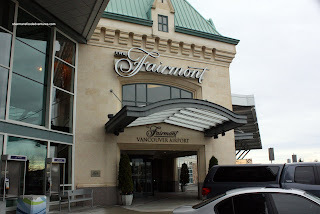 Seeing how we had already done the Burnaby Hilton, Hotel Vancouver, Waterfront and Pan Pacific already, there are only a few left which offer up a respectable brunch buffet. After perusing different menus, we settled on Glove@YVR. Normally quite busy, Vancouver International was quiet on a Christmas morning. With barely any cars on the road in Richmond, it was like Superstore late on a weeknight. Easy to navigate and frustration level at a minimum. The cool thing about Globe is the view of the domestic departure terminal. Nothing like plane-watching while dining. It's interesting to see planes at their gates moving along in an orderly fashion. This is probably the only place one would find any semblance of traffic order in Richmond. I ended up with an omelet with asparagus, ham, shrimp, mushrooms and cheddar cheese. I watched as my omelet was being made and I was imp ressed with the skill of the chef. As you can see in the picture, the omelet was cooked perfectly. It was fluffy and soft with no overcooking whatsoever. 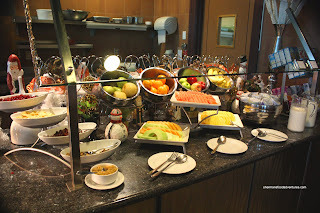 To the right of the hot breakfast items was the Fresh Fruit and Cereal Bar. In addition to a selection of prepackaged cereal and milk, there was a selection of pineapple, cantaloupe, honeydew, watermelon, whole oranges, apples and bananas. Rounding out the selection was yogurt and hot oatmeal with various toppings. Moving onto the Salads which were incidentally located on the other side of the restaurant. I liked this setup since it prevented any bottleneck. Everything was so spread out, it never seemed like I was lining up for anything. Furthermore, everyone moved along in an orderly fashion. A very strange sight for any restaurant in Richmond. This station was quite extensive consisting of Mesclun Greens with a choice of French Dressing, Soy Balsamic Dressing of Anchovy Dressing, Salad Niçoise, Caesar Salad with Condiments, Smoked Duck Breast Salad with Watercress, Apple and Hazelnuts, Char Grilled Asparagus with Truffle Cream and Chives, Slow Roasted Red Beets with Pea, Honey Sherry Vinaigrette, Oven Roasted Seasonal Mushrooms with Rosemary, Oven Roasted Sweet Potato with Turkey Bacon and Sage, Maple Sherry Vinaigrette, Classic Gazpacho, Greek Salad with Feta and Rosemary, Caprese Salad with Pumpkin Seeds, Basil Purée and Walnut Oil, and Black Olives with Roasted Garlic and Thyme. The highlight from this section for me was the Smoked Duck Salad. Viv thought the duck was rather salty; however for me, it was perfect since it provided all the flavour for the salad. The duck reminded me of a thicker proscuitto. 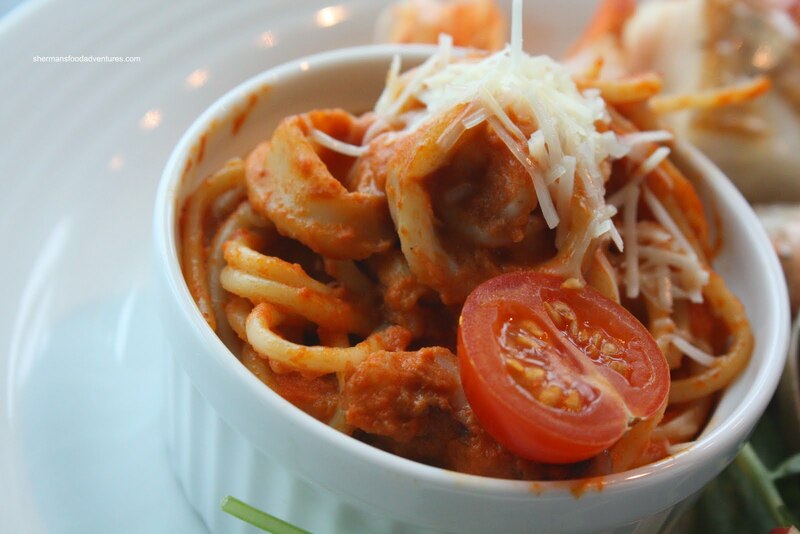 Now for the star of the show, the Seafood! This plate of goodies saw more action than Ron Jeremy. I gotta give it to the staff for keeping it fully stocked with fresh seafood. You might be wondering why this is generally served cold. Reason being is that seafood gets nasty when overcooked; hence if it is cold, it cannot cook no further. This section consisted of what you see in the picture (Prawns, Plump Mussels, Manila Clams and Dungeness Crab) in addition to Shrimp Cocktail with Spicy Gazpacho, Poached Salmon and Smoked Salmon. 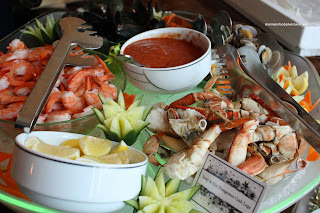 I liked all the seafood (overcooked salmon withstanding), especially the dungeness crab legs. They were very meaty and sweet. Lov e these way more than King Crab legs. The mussels were incredibly plump which were bathed in an excellent lemon butter. To the immediate right of the seafood was the Hot Food Station. The first item was the Lobster Bisque. It was quite a pale looking soup that did not have a lot of impact. Sure, I could taste the lobster; but it was neither rich or had any depth. It was merely thick and sweet. My dad thought it was rather fishy too. In the next couple of chaffing trays were veggies (Mashed Potato, Brown Sugar Butter Yams & Brussels Sprouts). I skipped it. There were 2 more trays which consisted of Squid Spaghetti with Garlic Basil Rosé Sauce and Fruits De Mer Grilles with Thyme Butter Sauce. Going against the no-carb policy, I got a ramekin of spaghetti. Of course it was far from al dente (buffet, what can you expect?). The squid was excellent though being tender while not mushy. The rose sauce was not exactly that impactful. It did taste okay though. The mix of halibut, salmon and prawns was actually pretty good except for the overcooked salmon. Curiously, the halibut turned out to be decently moist. 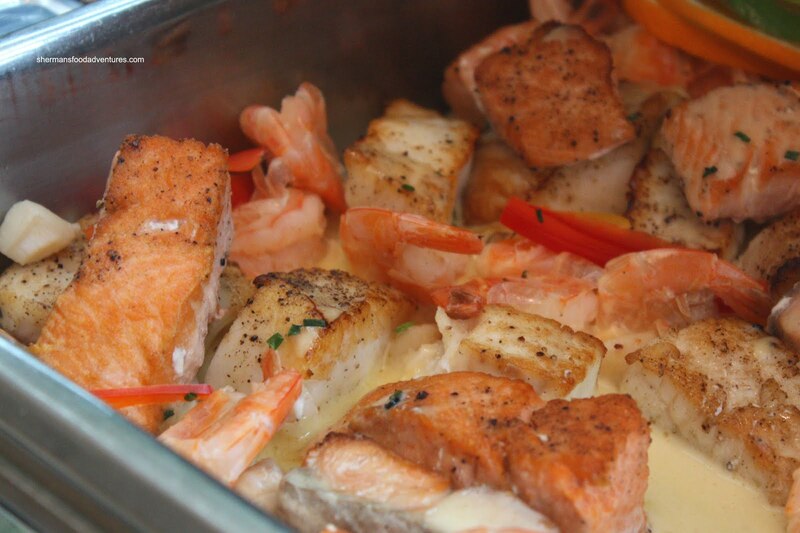 The beurre blanc sauce was very mild, allowing the seafood to shine. 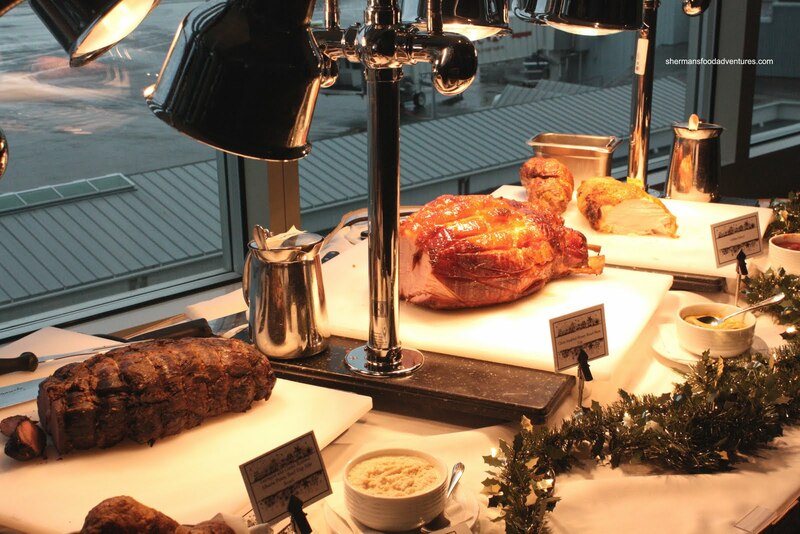 Moving onto the Carving Station, there was Sage Butter Basted Tom Turkey, Cranberry Preserves, Giblet Gravy, Roasted Corn and Pine-nut, Foccaccia Stuffing, Clove Studded Honey Roast Ham Leg and Tarragon and Garlic Rubbed Alberta Prime Beef Top Side Roast with Yorkshire Pudding. Although the beef wasn't the desired prime rib, it was tender and full of flavour. A clear indication of high-quality aged meat. I didn't end up trying the ham since I had already made a roast ham a few days before (which I ate for many more days after). Viv tried the turkey and it was moist since it was a combination of both breast meat and dark meat. 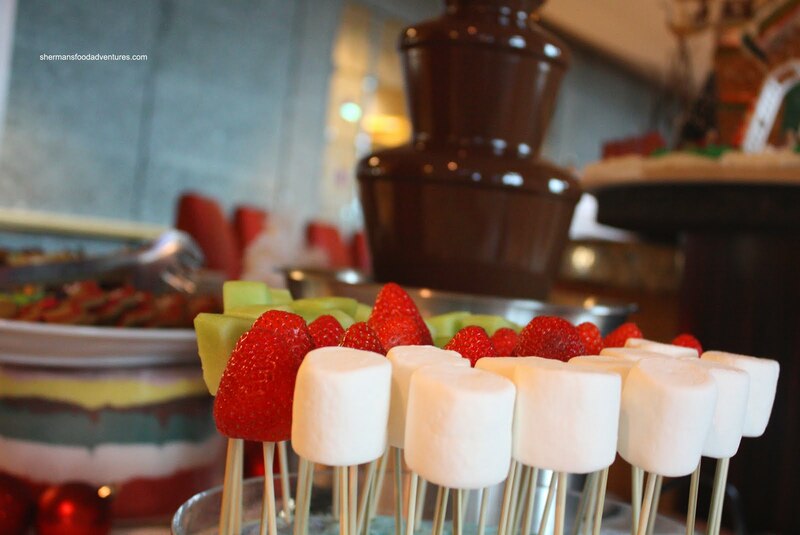 The Desserts were located in 2 separate stations (fruit already mentioned at the Breakfast Station). 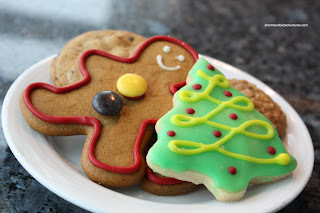 There was a table with various cakes and cookies. 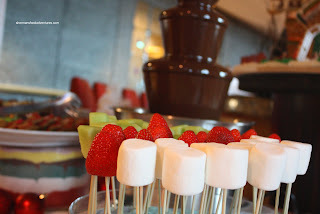 Directly across was the chocolate fountain with strawberries, marshmallows and honeydew on skewers. A plate of Christmas cookies rounded out the table. 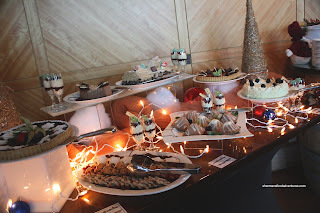 I only gave a few desserts a try since I was incredibly full from trying almost everything. 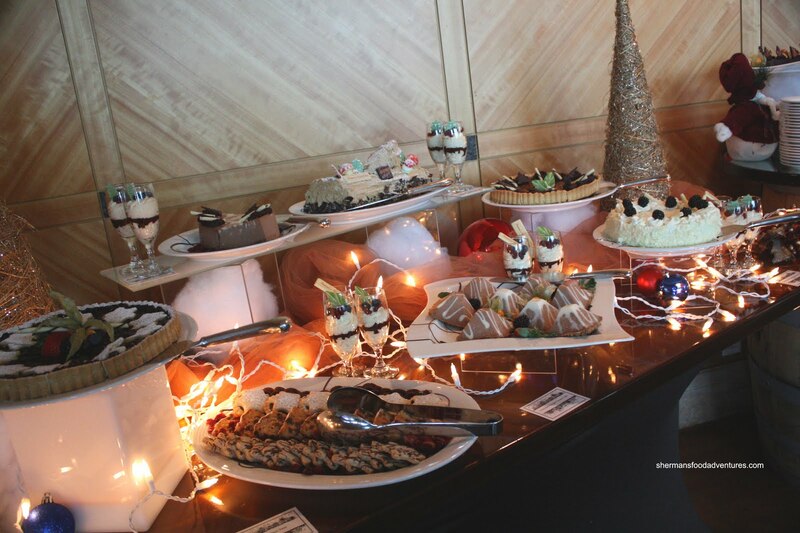 The general consensus was that the desserts were decent. Nothing that really stood out; but nothing that made us want to spit it out either. 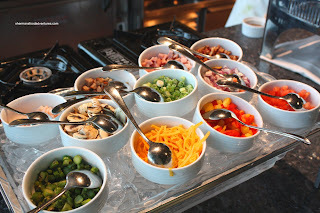 In terms of the brunch buffet as a whole, it had some high points and some lows as well. 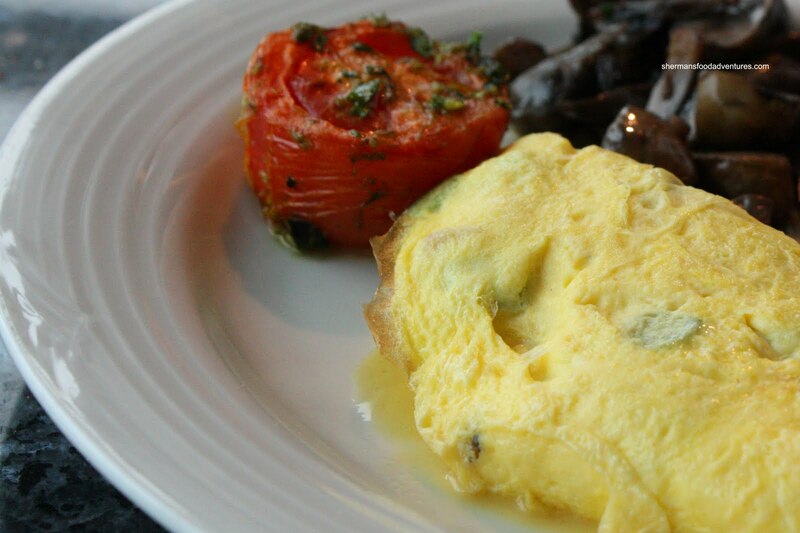 The breakfast items were good, as with the seafood. Most of the hot food was pretty average while the carving station was respectable. Desserts did their job and we got great service throughout. 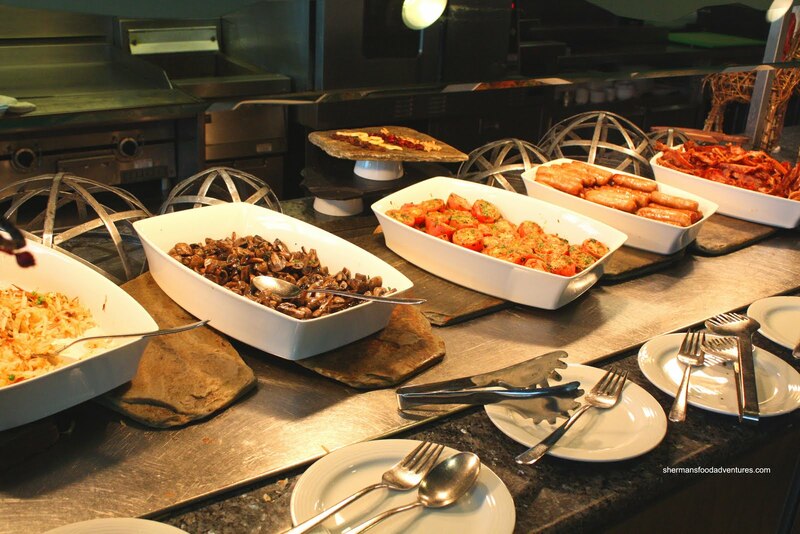 As mentioned, their regular brunch is much more scaled down and less expensive. Given that we dined on Christmas Day, the prices will naturally be inflated. That's a pretty darn good looking brunch buffet...comparable to some of the nice ones in Las Vegas. How much was that Christmas buffer vs regular brunch buffet? 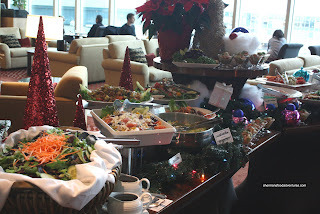 Christmas buffet was $62 while the regular is $26. 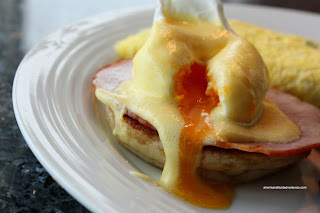 The brunch was not bad, some items better than others, but the breakfast was solid.